No More Pictures: See with Your Own Eyes! TAIPEI, Taiwan—You may imagine a band on stage making an appeal to its audience to take no pictures or to record nothing during its performance, but can you think of the band asking the audiences not to go to its concerts if they are not willing to follow these rules? On 12 December 2015, there were fans who went to Sodagreen’s Endless Story Concert getting mad at the staff and cursing them when they were reminded not to take photos. In response, Qing-Feng Wu, the band’s vocalist posted on the Facebook official fan page, “People who are not willing to obey the rules, please don’t come to our concerts, for there are conflicts between our thoughts.” He also added that it was never right or legal to take pictures during the performance even if some people were not caught for doing so. Fans may consider the band to be arrogant, but isn’t it the individual’s right to take pictures? Most people more or less know that taking pictures at concerts is illegal but they continue to do so even with the threat of legal punishment. Even on the ticket being sold, it is stated clearly that whoever buys the ticket should not take any photos or record anything during the performance. Many fans take pictures because they want to capture the moment of being at the concert, and they want post these pictures on social networks to show their support for and love of their idols. Meanwhile, some may do so only because people around them do it as well. According to the Copyright Act, “A person who infringes on the economic rights of another person by means of reproducing the work without authorization shall be punished by imprisonment for not more than three years, detention, or in lieu thereof or in addition thereto a fine not more than seven hundred and fifty thousand New Taiwan Dollars” (91 Article). That is, snapping photos in concerts without authorization is the same as stealing others’ ideas, and people who do so will face punishment. However, many Taiwanese do not get punished immediately after violating the law. Hence, they may neglect it easily, which makes the situation worse. Some people may defend themselves by claiming that they will not sell the pictures but to keep them. However, this act isn’t fair use either. For the “fair use” of copyright in concerts, it is more concerned about the “nonprofit educational purpose,” and the “influence on the exploitation of the market value” (65 Article). 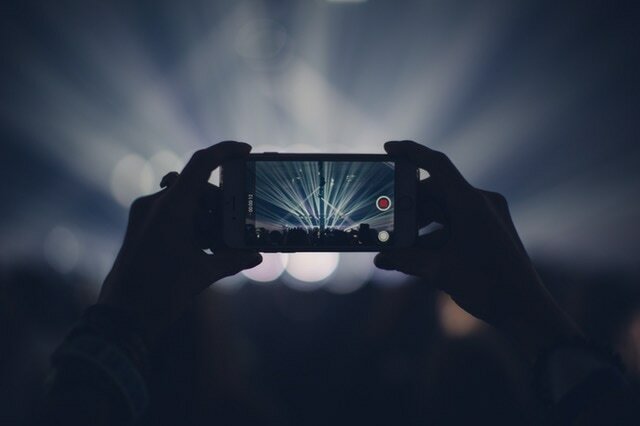 Therefore, recording or snapping pictures may influence the band's market value by giving people a chance to experience the concert without paying anything. I took pictures when I went to the concert for the first time. Yet, I later found out that taking pictures would not allow me to remember most of the details, including the feeling the concert brought to me. When I was focussing on capturing the moments on stage, my attention was actually on my camera or smartphone. Thus I wouldn’t be able to directly “see” what was happening on the spot. After I clicked the shutter, what I did was to check if the picture was good enough. The time was then wasted. I was only staying in the same place as my idols but seeing them with the lens. I have finally realized that people who took pictures would divide the whole coherent performance into several pieces because all these pictures were only parts of the show. The performers must have spent a great deal of time practicing to make things perfect. They have their own teams to create a wonderful visual and audio feast. So, when you take a picture, you are showing no respect to their intellectual property rights or the idols. Imagine yourself to be an idol on stage, would you want to see the audiences look into your eyes with shining eyes or face a bunch of lens? Think it in another way, the pictures you take are not likely to be much clearer or more beautiful than the professionals, so why do you waste your time to get some blur photos home? For almost each concert, there will be professionals taking the photos which will be released to the public after the concerts. Those pictures with close-up views shot by the professionals are even more precious and can certainly be used to recall the great memories. Most importantly, those who take pictures will block the sights of people behind. Photo-takers will stretch their cameras and smartphones into the air, and people who want to watch the show through their eyes will have to seek the tiny spaces to enjoy the performance. This is an annoying and selfish behavior especially when people are using big and professional equipment, which occupies even larger views. If everyone puts down their cameras, the view will totally be different. So, next time when you go to a concert, why not just indulge yourself in what your idols want to bring to you?